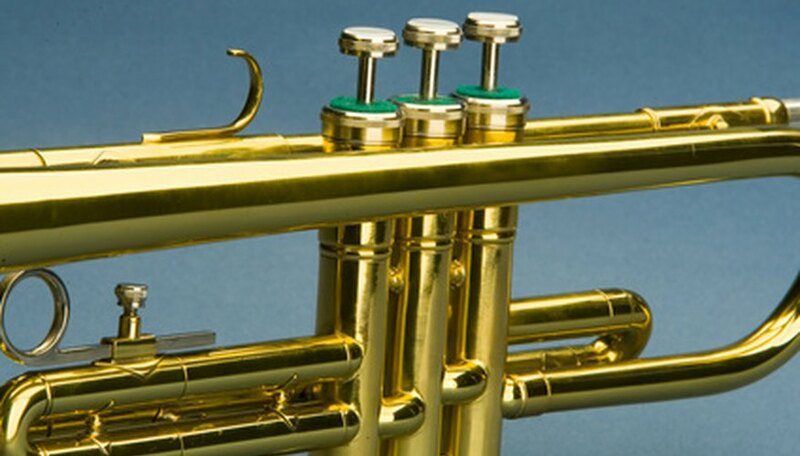 Though many prefer the look of a shiny brass instrument, others prefer the more natural and rugged look. Lacquer is applied to brass instrument to protect them from tarnish and give them a shiny and glossy appearance. Silver plating is another option to protect the metal underneath. If you decide that the shiny look is not for you, then the lacquer will need to be removed. Without the use of harsh chemicals and abrasives, removing lacquer is a fairly simple task. Fill a large pot with water and set it on the stove. Remove all removable pieces such as the mouth piece and place them into the pot, making sure that the instrument is completely covered with the water. If the instrument is too large, you will need to do one half at a time. Add 1 tsp. of baking soda per quart of water in the pot. Turn the stove on high and allow the water to boil for 15 to 20 minutes. Remove the instrument from the pot carefully with gloved hands to prevent getting burned. Peel away the loosened lacquer with your fingers or wipe it away with a clean, dry cloth. Repeat the process on the other half of the instrument with fresh water and baking soda for larger instruments. Remove any remaining areas of lacquer with a cotton ball or soft clean cloth dipped in nail polish remover with acetone. Use a small, soft bristled brush for hard-to-reach places. A brass instrument that has no lacquer to protect it will require frequent polishing with a brass polish to protect it from tarnish.